Our last leg was another long drive: We were driving from El Calafate to Rio Gallegos under bad weather. From there we entered Chile. After we had finished the migration, we continued to the ferry which took us to Tierra del Fuego. Fortunately you don’t need a reservation for the ferry, you just have to wait in the line and half an hour later you are on your way. Fifteen minutes later we finally reached Tierra del Fuego! But the weather was not getting any better. Under rain and wind we continued to Ushuaia. Unfortunately we had to ride on 80 miles of dirt road. The road was one of the worst we had so far. We had to cross numerous pot holes, puddles and pieces of wash board roads. Soaking wet and freezing we arrived at the border to Argentina in San Sebastian. We could cross the border rather quickly, but anyway it was already quite late and raining heavily. The expected city of San Sebastian unfortunately was not more than a border station, a gas station and a hotel. Since the next real city – Rio Grande – was still 50 miles away, we decided to stay for the night in the quite expensive hotel. Some other travelers, whom we met earlier, also staid in the same hotel. So we spent a nice evening with them in the hotel restaurant. During the night the weather got much better and we started our last leg to Ushuaia under nice sunshine. About 50 miles before arriving in Ushuaia, a motorcyclist with swiss license plate passed us and was waving. It was Georg, whom we met while crossing the Darien Gap on Stahlratte. After a heartily welcome, we drove the last miles together to our goal, Ushuaia. Unfortunately the weather was getting worse again and we were quite cold. So we went to a little, nice Cafe in Ushuaia first. After warming up, we rode to the end of Ruta 3 in the Tierra del Fuego national park. After 6.5 months and more than 30.000 miles we finally arrived at our goal! On our way back into the city, we met two other bikers, whom Carmen got to know via Facebook and whom we now met for the first time in real life. Claudia and Werner are traveling with their BMWs across South America and plan to join the Stahlratte tour across the caribbean in April. We decided to drive to the visitor’s center for a cup of coffee and talked about our experiences. At late afternoon we finally drove to the camping place Rio Ripo, on which many motorbike travelers meet during Christmas and New Year’s eve. Here we staid for a few days and had a great New Year’s eve party with many other travelers. Actually we planned for a day of rest today, but a look at our map showed us that we are not that far away from glacier Moreno. So we decided to ride the 60 miles to the national park Los Glaciares. Again we enjoyed the amazing landscape of Patagonia while riding beside the Lago Argentino. After we arrived in the national park, we took a small boat tour to the glacier. We were lucky again: Like in Alaska, again a big piece of ice was breaking and falling into the water, making a lot of noise. For our way back we chose a little gravel road via the Lago Roca through the national park back to El Calafate. The rest of the day we spent with things like laundry, planning the route for the next days, updating our blog, etc. For the next days we wanted to continue our journey on Ruta 40 heading South, because Ruta 40 has got quite some pieces of dirt and gravel despite Ruta 3, which we originally wanted to take to Tierra del Fuego. Shortly after Malargue the first 40 miles of gravel road started, which were easy to drive although it was pretty windy. Afterwards we continued on a very good piece of tarmac of the Ruta 40 and the wind was even getting more heavy. Unfortunately the wind was not only quite heavy but also gusty. After an exhausting ride until late evening, we finally arrived in Chos Malal and tried to find a hotel. That however was not easy. Therefore we were quite grateful that a local guy helped us and was leading us to several places. At last we found a good bungalow owned by a friend of him. On the next morning, Christmas Day, we realized that neither supermarkets, restaurants nor gas station shops are open. We already accepted two days of hunger when we found an open bakery. Equipped with fresh bakery products, we started our next leg to the South, which should consist mainly of dirt and gravel roads according to our map. We were a little bit disappointed when we realized that most of the road had already been tarmaced. Nevertheless we still found a few miles of gravel and dirt road for a change. That day’s leg led us to Gobernador Gregores. Another motorcycle traveler warned us, that Ruta 40 has a very bad piece of muddy road here, which is hard to manage. When we read that message again in the evening, we realized, that we maybe passed that piece of road already. Since we were not 100% sure, we anticipated the worst for the next day: Pulling the bikes through 100 miles of mud. 🙂 But we were lucky: Sunny weather changed the muddy underground into a pretty good dirt road. After we arrived in El Chalten, we enjoyed the view at Fitz Roy and drove to Lago del Desierto. The gravel road to the lake was a real highlight. The landscape and the driving itself was real fun. We still did not have enough for the day and therefore we decided to continue to ride the next 150 miles to El Calafate. Our tour led through the varying landscape of Argentina, which consists of wine regions, cactus landscapes, dense, green forrests and more. The wine region is located from Salta to Mendoza and reminds us of the wine regions in Italy. In Cafayate, a little town in the middle of those wine regions, we did an unplanned break, not only for getting fuel but also for doing a road side repair on Michaels bike. Michaels clutch wire was broken and it’s hard to continue without a clutch. Fortunately Michael could buy an universal wire in Cafayate and we could continue our ride. We arrived in San Miguel de Tucuman in the late afternoon and looked for an accommodation near the center of the town. After checking in we rode to the local BMW dealer to get some service done, like changing chains, tires and adjusting the valves. After doing our job, there was time for enjoyment: We looked for a nice restaurant to enjoy the famous argentinian Steak with some tasty argentinian red whine. After we picked up our bikes at the BMW shop, we started our trip to Cordoba. Many hundreds of miles later, the day was almost over, but Cordoba still far away. So we decided to camp in the wild for the first time. This was not easy however, since the whole country beside of the road is fenced. Much later we found quite a good spot at a salt lake but there was a sign saying “Attention! Swampland!”. So we continued our search and finally decided to camp directly at the side of the road behind a few bushes. On the next morning we continued heading to Cordoba, but decided spontaneously to turn heading to the west, in order to take Ruta 40 to Ushuaia. We drove a couple of hundred miles heading south west. After our good experience in wild camping we decided to camp for yet another night. More or less in the middle between San Luis and San Rafael we took a tiny sand road and found a good camping spot a few meters later. Since we were more than 100 miles from any city we felt quite safe. After an amazing sunset this feeling changed a little bit: After it got dark, life returned on that little sand road. Even after midnight vehicles were driving along the sand road into the wilderness. We got a little bit scared, since we could not think of any legal reason for driving that road in the middle of the night. After two days of camping in the wilderness we continued heading to Malargue. While taking some photos we saw a german motorcycle driving by and turning. To our surprise it was Mathias, whom we met several times on this trip, together with his girlfriend. We took that opportunity to ride to Malargue together and get some lunch together. Afterwards Mathias and his girlfriend staid in Malargue over Christmas while we continued on Ruta 40 heading south. After our little trip to Bolivia, we entered Argentina on the next day via Paso Jama. Since there is no customs on the chilenian side we had to do the paperwork in San Pedro de Atacama already. So we did officially leave Chile already, although we were 100 miles from the border. Interestingly they even told us that we were not allowed to drive back to the gas station in San Pedro, but we just ignored that, since the next gas station was supposed to be 300 miles away. The road to the border was leading besides more salt lakes and across 4800m passes. Although our bikes were still running well ( because of the injection ) we felt that there was not much power available. So we were driving rather slowly across the passes. The paperwork was pretty easy, but still took some time, sine a big bus arrived just before we did. Surprisingly there was a gas station right at the border, so that we did not have to use our gas cans. At another salt lake, the Salinas Grandes, we did another foto stop and were driving across the lake. After we continued, Michaels bike started to wobble a bit and Michael suspected a puncture. He glanced briefly at the wheels but everything was fine. So he thought that it was just a little bit windy. However it was strange that a car behind him honked, but the south americans are honking because of anything, so he ignored that. Our way was leading through curvy mountain roads surrounded by cactuses. A nice landscape, so we stopped for taking pictures. Michael used that opportunity to check his wheels once more when Carmen asked: “What did you do with your pannier?”. Michael did not answer and Carmen asked again. Then Michael realized at last that his left pannier was missing including the rollbag on top of it. Unfortunately this very pannier was holding the MacBook, credit cards, hard disk, tools, and clothes. So we immediately turned back to the salt lake to search the pannier. We were driving the piece of road up and down and asking everybody, but nobody saw or knew anything. Since it was quite late already and since Michaels bike currently lakes any lights, we had to go to Purmamarca to find an accommodation. In Purmamarca we went to the police to tell them about our loss, hoping that the finder will bring the pannier to the police. But the guy at the police just took Michaels name, phone number and email address and did not ask anything. That was our last hope to find the pannier including its content. Purmamarca is nice but very small and so we continued to Salta, a larger city nearby. There Michael could buy some of the things he lost. 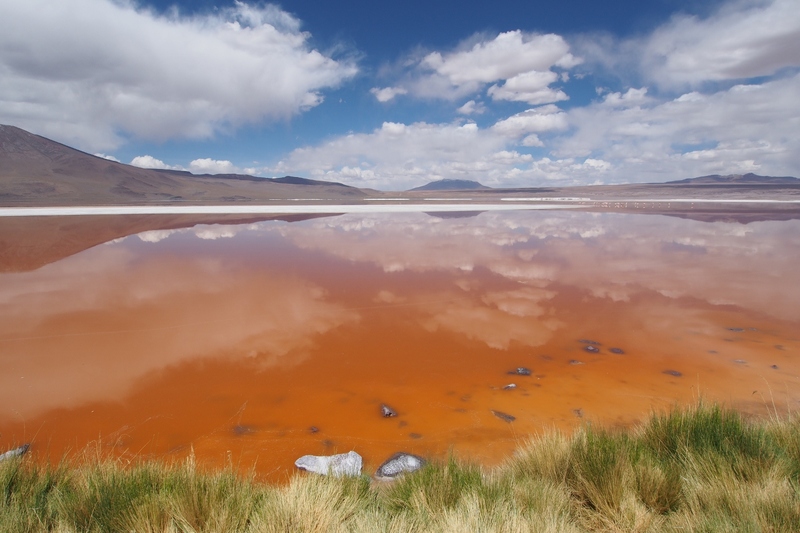 Not far from San Pedro de Atacama there is the beautiful Laguna Colorada in the south of Bolivia. Since there are only bad sand roads leading to the laguna, we decided to book a 4WD tour to Bolivia. However we were not sure whether we would get problems when crossing the border without our motorycles, but after asking customs in Chile, they said that this is possible without problems. 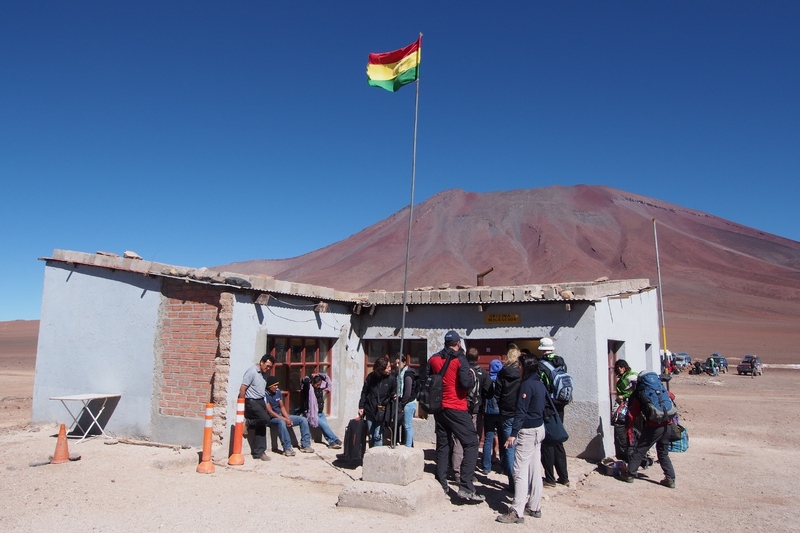 After we finished customs, we went to the bolivian border which was nothing but a small hut and a “pee bus” in the middle of nowhere. There we did not only get our migration stamp but also a small breakfast. In Bolivia the roads were getting worse pretty quickly. After a few milers we were driving through deep sand and gravel roads and sometimes completely offroad. 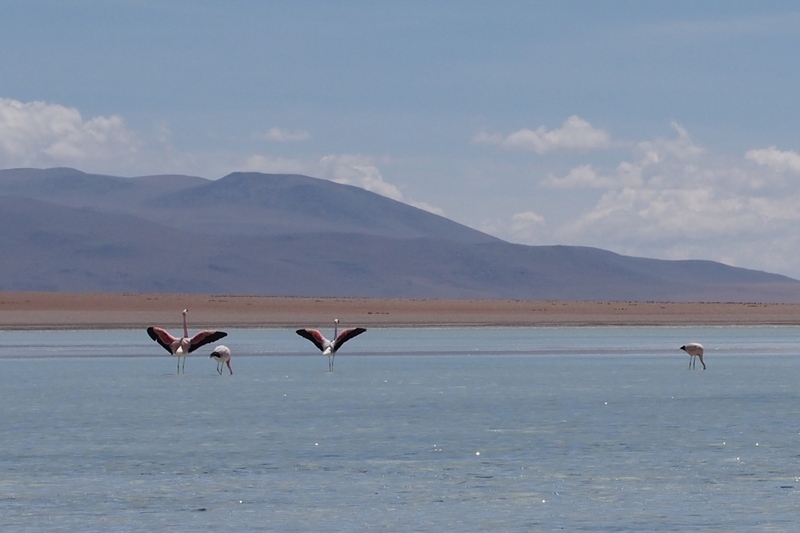 We did our first stop at the Laguna Salada, a colorful salt lake in which flamingos were looking for food. 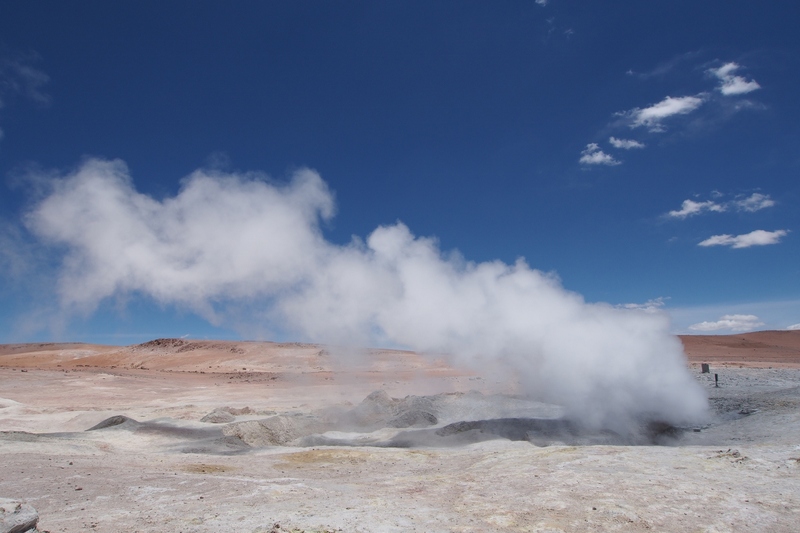 The tour continued to geysers and the actual highlight: the Laguna Colorada. 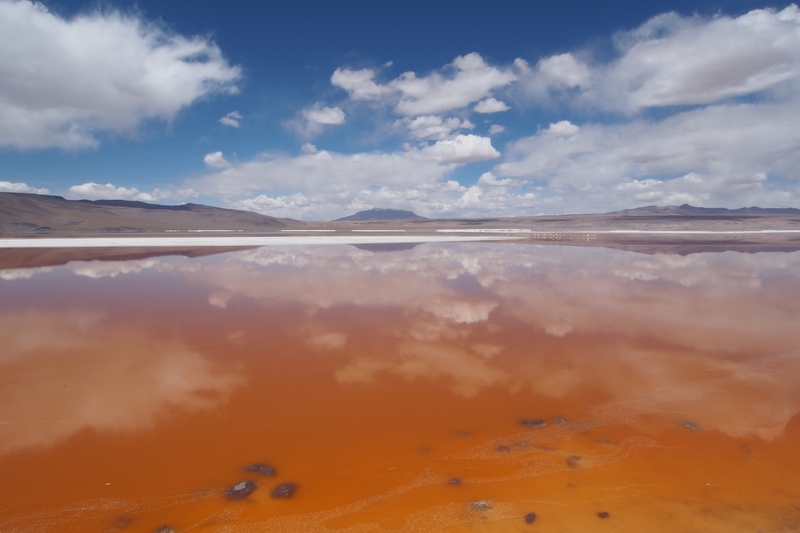 The Laguna Colorada is almost glowing in different red tones in which the mountains and clouds are reflecting: an impressing but also surreal landscape. 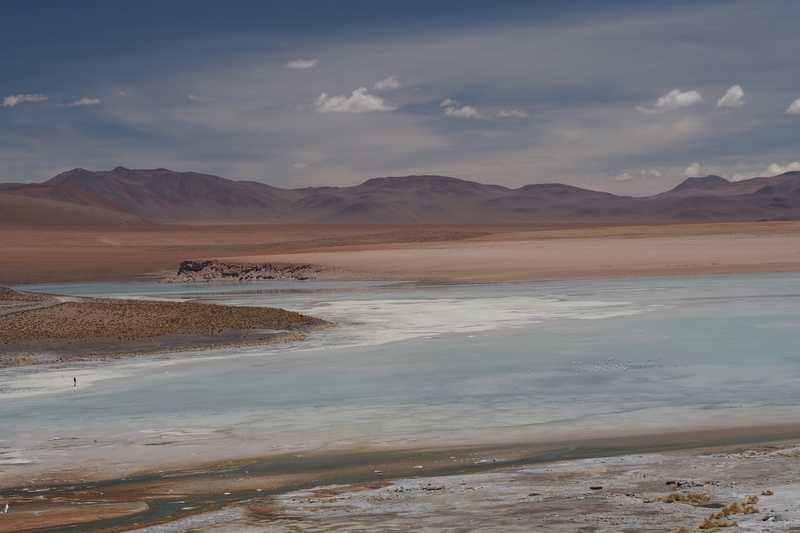 After our stop at the Laguna Colorada we continued at high speed and bad roads to Laguna Verde and Blanca. Since it was pretty late already, we just did a quick foto stop there and drove back to Chile. In San Pedro de Atacama we again did customs to enter Chile. However this time it took a little bit longer, since the customs officials found a big amount of drugs and therefore we pretty busy. On our ride to San Pedro de Atacama still everything was fine. Then there was a sign heading to the Moon Valley. So we took the turn onto a gravel road and tried to find the moon valley. We were getting bad feelings when we saw a sign warning about mine fields. But the mine fields were enclosed by fences, so we just continued. After 20 miles of gravel road we still did not see the moon valley and decided to return. Approximately 3 miles before we arrived back at the highway, it happened: Michael overestimated his riding skills and his bike started to fishtail at about 40 mph. He lost control over his bike and flipped over. Carmen just saw a huge cloud of dust and when the dust disappeared, she saw the chaotic scene: Michaels panniers and luggage was scattered across the landscape and parts of the bike, like mirrors and indicators, were laying on the ground. The cockpit of the bike was completely crushed and speedometer and rpm were destroyed. However Michael was pretty well and not hurt beside some scratches. After a little rest we tried to fix the bike. We attached the panniers and the luggage temporarily and bent the cockpit so that Michael was able to steer the bike again. Very slowly we were driving to San Pedro de Atacama and checked into a hostel. On the next morning, Michael removed all damaged parts and bent the cockpit so that he could drive the bike again. Afterwards we did a small test drive to the Salar de Atacama, a salt lake in the Atacama desert. The Salar de Atacama is much smaller than the famous Salar de Uyuni in Bolivia, but at least we now have a little impression of the beauty of the salt lakes. Afterwards we continued our search for the moon valley. This time we took the right turn and arrived at the moon valley after a few miles. We took some pictures and rode back to the hostel. In the hostel we met Linda and Samuel, two germans, whom we got to know in town in the morning. 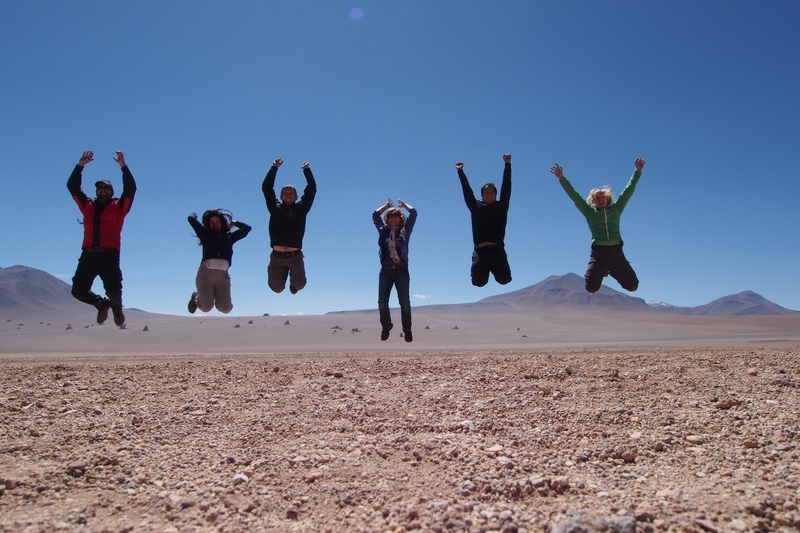 We spent a nice evening together in San Pedro de Atacama. 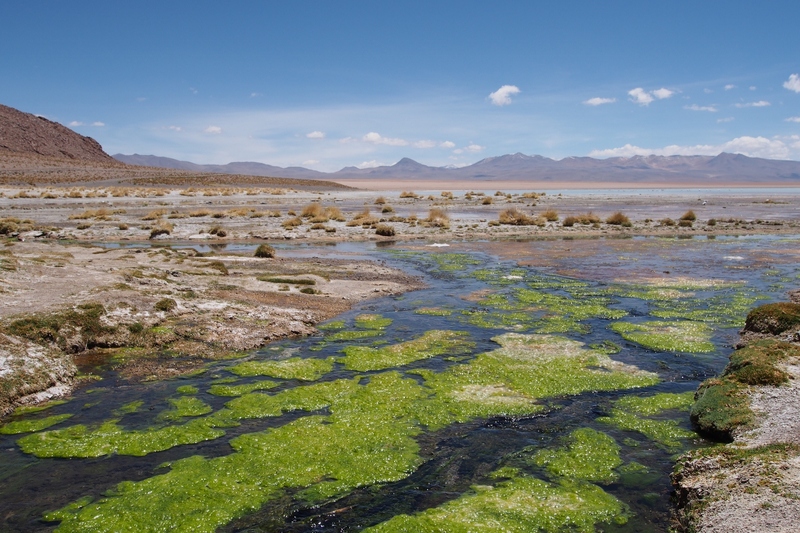 Let’s go to Bolivia… or better Chile? Our actual plan was to continue to Bolivia, so we went to Puno at the Titicaca Lake near the border to Bolivia. Besides the view at the Titicaca Lake, Puno is quite an ugly town. We had a hard time to find a good accommodation including parking lots for the bikes. Finally we managed to find one. In the evening we wanted to prepare for our ride to Bolivia and found the following web page about the road conditions in Bolivia. Reports by other travelers were not better either and so we were thinking a long time on how to continue. On the next morning we finally decided to ride to Chile, since the road conditions seem to be pretty bad in the rainy season in Bolivia. 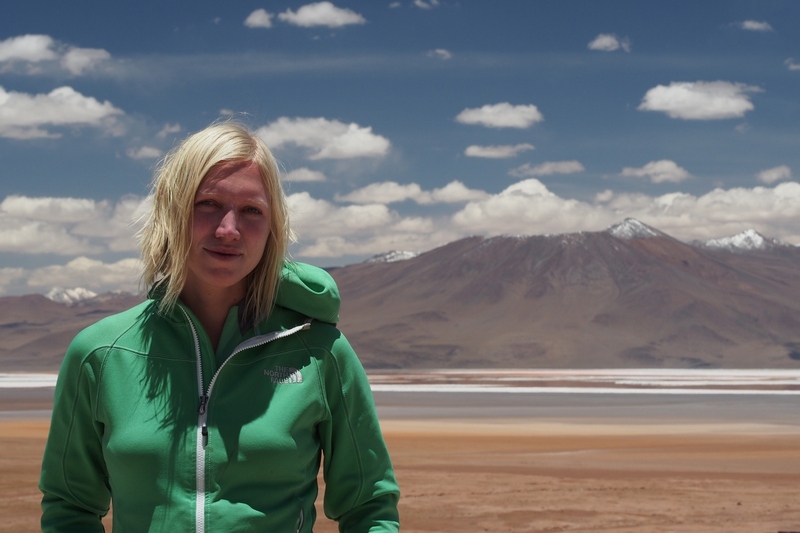 Unfortunately this means that we won’t see the Salar de Uyuni, a huge salt area in Bolivia, which we wanted to cross. Anyway most of the Salar seems to be covered by water already, so we would not have been able to cross it in any case. To go to Chile, we had to drive back to Tacna at the coast. On our ride, the police stopped us and asked for an insurance which we did not have. 😉 Fprtunately they accepted our fake insurance which we printed ourselves a few weeks ago. The border crossing itself was very easy but quite annoying, because the first time we were asked to detach all our luggage and bring them to x-ray. At night we staid in Pozo al Monte, a little city in the north of Chile. After another ride across the mountains including 4000m passes, we arrived in Cusco in the afternoon. Alex and Mathias, two bikers from Germany, recommended a cheap and biker-friendly hostel in the center of Cusco. When we arrived there, we were pretty surprised that another 5 bikes with 8 bikers, all from Germany, were staying in that hostel. All bikers are traveling South America heading to Ushuaia. In addition to the german bikers, Steve and Roy, two bikers from Norway, whom we got to know on Stahlratte, were in Cusco as well. In the evening we joined them for dinner, but we made a bad choice: We went to a cheap touristic restaurant offering a complete menu for just 15 soles ( about 7 dollars ). So it was no surprise that the Alpaca steak was cold and tough and besides wanted to leave our digestion organs pretty quickly. 😉 Anyway we went to a bar for a last drink and ordered the national drink of Peru, the “Pisco Sour”. On the next morning we took breakfast together with the other german bikers and said good-bye to them, because most of them left for the Colca Canyon after breakfast. Since both of us have seen the Colca Canyon alreads, we staid for another day in Cusco and visited some ruins from which we had a very nice view at Cusco, as well. Since Steve and Roy were flying back to Norway the next day, we took the opportunity to have another dinner with them. This time we chose a rather expensive location, but the food was very good! Our next destination were the famous Nazca-Lines. On our way we had pretty heavy cross wind which seems to be typical for the coast of Peru. So we had a little foretaste of what is to come in Patagonia. Our ride led us through the dense traffic of Lima as well and we were quite happy when we left the big roads in Lima. After a long ride we arrived in Nazca in the late afternoon and decided to fly over the famous lines in the next morning. At 8am a taxi picked us up and we were driving to the little airport where we had to do a check, like luggage control, weight, etc. Afterwards we entered a small Cessna and started to take off. The Cessna was flying very low and flying steep curves, so that we could see the lines very well. This was a good idea, but after 10 minutes we were both feeling very sick and so we just hoped for a fast landing. Four days of sailing on “Stahlratte” was a piece of cake compared to the 20 minutes flight across the Nazca Lines. We were really surprised that the people did not throw up on that flight. Our conclusion: Much money for getting sick and not the best view either. After the flight we had to rest for some time before we continued our voyage. We went across the mountains heading to Cusco, but since we started not before noon, we had to stop in a little village in the mountains. We actually thought about camping in the mountains, but due to the cold weather and the heavy rain, we were very happy to find a hostel including parking space directly besides our bets.